Can we create an environment where winning (success however you measure it) and employees feeling valued, respected, and part of something special are mutually inclusive? The answer is yes! Many leaders remember those life changing moments where it suddenly became crystal clear what has to be done to reach their organizations’ goals. It wasn’t until Pete Luongo was faced with that one epiphany in life, a difficult period that required him to rebalance life’s priorities and bring a new level of understanding to his work , that he recognized that all results are based on behaviors appropriate to the circumstance. Through this understanding—that actions are determined by specific, well defined standards—he developed a model for success, one that is both sustainable and that allows people to retain their personal dignity as they pursue their life plans. 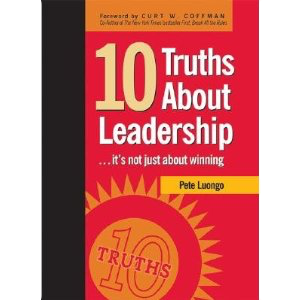 In his book, Luongo illuminates the “The Leadership Pledge” and the five tenets that make up the model; Recruit, Hire, and Retain, Provide the Support, Set the Standard, Share Honest Feedback, and Encourage Individual Accountability. He describes the ten most common obstacles to success and pairs them with ageless principles, the 10 truths that serve as the underpinnings for the code of conduct and are life lessons that help overcome those obstacles. His straightforward advice, based on data and hard earned experience, provides an understandable and virtually guaranteed plan for improvement and achievement.